Haiti's apparel exports are set to rise 8% this year despite political turmoil that has seen several factories in the capital Port Au Prince area shutter in recent months. "Haiti will continue to grow this year," says Fernando Capellan, owner of Grupo M, which runs the Codevi apparel industrial park in northern Haiti, just at the border with Dominican Republic, where he operates an integrated supply chain. 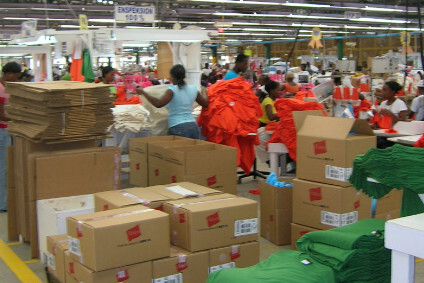 Capellan said nearly a month of protests and riots aimed at unseating embattled President Jovenel Moises did not paralyse the apparel sector, which last year sent $927m worth of garments to the US, up 7.7% from $861m in 2017. "Haiti has been growing 8% to 10% every year. There is no other part of the world where you can get this type of light [basic sports apparel] manufacturing" as benefiting from the US proximity advantage. Capellan claims Codevi continues to grow, despite the growing cloud of political uncertainty and ongoing labour disputes that have long plagued the impoverished nation where income per capita hovers at $250 per month. "We are going to create 14,000 jobs this year [up] from 11,000 last year, and we are in line with our goal to create 25,000 jobs." The executive, who also expects to grow sales 18% in 2019, says Haiti has a "golden" opportunity to create millions of jobs if the US and the international community raise support for the nation. Key is helping to usher a transition from Moises' government, which stands against heavy graft and other corruption charges, just as the population faces rising oil prices boosting already high transport costs. Carlos Arias, a regional apparel industry veteran and CEO at Hong Kong based activewear supplier Winds Group, which opened a factory in Haiti two years ago, agrees Haiti has potential but its continual political problems stand to ruin any gains made by clothing entrepreneurs eager to benefit from the HELP and HOPE aid programmes to develop the industry. "We are still operating close to our goals but we are worried and we hope that the political factions can come up with an accord so we don't have any more demonstrations and no more negative perceptions of instability in Haiti." He concedes, however, that several factories shuttered in Port Au Prince following the violent riots that killed seven people and injured dozens. Roads were also blocked, triggering logistic delays that crippled exports. "There were closures for nearly a week," he says. "No-one wants this. We want a solution as soon as possible." Based on monthly exports of $77.3m, one week of idle capacity may have cut foreign shipments by $19.3m. But some observers claim the upheaval lasted most of February and then beyond so losses may be bigger. Plus, Haiti's economy stands to take a big loss after February's Carnival celebrations were cancelled, erasing $5.8bn of revenues for the economy, which is unlikely to meet a real growth target of 1.5% this year according to US officials who have also warned Americans from travelling to the island. Arias says he is hopeful that a solution to the political stalemate can be wrought this year as prolonged protests only hurt the nation's citizens, the poorest in the Western Hemisphere – a message businesses have been trying to hammer home. "I remain positive," Arias says. "Haiti is a country of good people with good hearts. They are humans like everyone else and they just want to do good things and live in peace." The recent unrest follows demonstrations by Haitian garment sector workers at the end of last year to show their dissatisfaction with a rise in the minimum wage. However, to help local makers, the annual limit on duty-free apparel shipped from Haiti to the United States this year has been raised by 3.1%. The Haitian Hemispheric Opportunity Through Partnership for Encouragement (HOPE) Act allows duty-free treatment for certain apparel imported directly from Haiti as long as the articles are wholly assembled or knit-to-shape in Haiti from any combination of fabrics, fabric components, components knit-to-shape, and yarns. Haiti has also returned to the cotton supply chain for the first time in 30 years thanks to a project between Timberland and the Smallholder Farmers Alliance (SFA) to reintroduce cotton farming to the country.